27.2: The negative particle with this preposition is the enclitic አል «al-», thus forming: አልቦሙ (albomu = not in them) አልብነ (albəna = not in us) etc. 27.3: The most important function of this preposition is that (with the 3rd m. sing. suffix) it indicates existence (there is…, there are…), just like the particle yeš in Hebrew, īt in Aramaic and thamma in Arabic. The following noun may sometimes decline in the accusative. There is a house in this city. There are no houses in this city. There is no star in the sky. There is someone who found me but he did not tell me his name. There was no one who heard their voices when they entered the city. There were those who fled from the house where they were hiding. 27.5: Another very common function of this preposition is that it indicates possession. The possessed object is usually declined in the accusative case, like the object of a verb. We have a house on the mountain. I have water and you have no water. The queen has no servants in her chamber. The priest has his scrolls. The infidels have no faith. 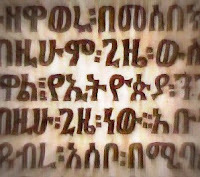 I think it is ደብር not ድብር. Thank you for this lovely website, and your efforts to preserve Ge'ez. Congratulations from Brazil, Nice to meet you. I m studying hebrew for many years And now through this blog I started to study Geez.